The company Dürselen KG was founded in 1966 by Hans-Joachim Dürselen. 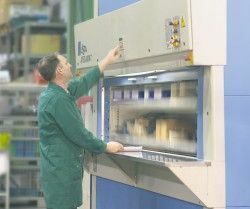 In 2009 Dürselen KG changed its legal form to Dürselen GmbH & Co. KG. In 2015 the mechanical engineer and business economist Dirk Berg took over 100% of the shares in Dürselen GmbH & Co. KG from Hans-Joachim Dürselen in the course of the age succession regulation. Our company was founded in 1966. We offer machines for the Graphic Arts industry since the early seventies additionally to our work as component supplier. Since 1991 we are specialised in paper drilling machines, automated paper drilling systems and corresponding peripheral units. Furthermore we design and build speical purpose machines for different applications and sectors. Together with qualified dealers in many countries we work out solutions for all applications incuding in-line paper drilling systems based on our standard paper drills and completed by individual components. Our skilled service department supports our customers regarding applications, operation and technical problems at short call. Usually we deliver spare parts, consumables and tools like paper drills the same day we get the order. In any case we inform our customers if we cannot deliver immediately. 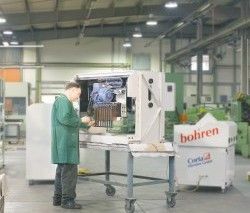 More information on our production capacities and machinery is available at the homepage on Dürselen machine engineering.